The coming of a new year is always a time for dreamers. And as we break into 2011, the International Fund for Agricultural Development’s Latin America and the Caribbean Division is dreaming big. In the upcoming year, we hope to bring over 10 new project-funding requests to our Executive Board for approval – plus a half dozen country and regional grants. These projects will work in places like Argentina, Brazil, Colombia, Ecuador, Haiti and Honduras to improve market access for family farmers, ensure long-term sustainability, increase territorial approaches to multiply (and magnify) economic opportunities, and facilitate pro-poor policy dialogue. More importantly, these projects strive to leverage our collective wisdom to create better lives for the rural people living in poverty in Latin America and the Caribbean. And while we must look forward to bigger projects, greater challenges, and a whole lot of work in 2011, I think it’s important to reflect first a little on our past. 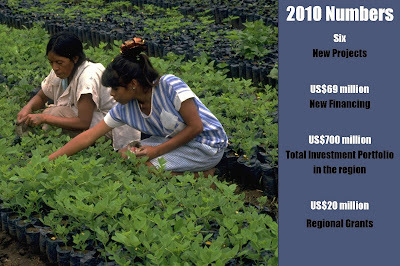 IFAD’s Latin America and the Caribbean Division currently funds 33 ongoing programs in the region. There are projects in 20 member countries with a total investment portfolio of around US$700 million. In 2010, the IFAD Executive Board approved six large programs in the region. The Latin America and Caribbean Division also continued working with our ever-evolving regional portfolio, as well as on a number of grants that provide the backbone of our knowledge-management and policy dialogue platform. In the Dominican Republic, the US$48.5 million Rural Economic Development Project in the Central and Eastern Provinces will increase the incomes and assets of poor men, women and young people. It will do this by building strong organizations and by creating mechanisms for these organizations to access markets and value chains. This program will work in concert with the Development Project for Rural Poor Economic Organizations of the Border Region, which will be implemented in 11 provinces in the western area bordering Haiti, where poor smallholder farmers are cultivating high-quality organic coffee and bananas, but lack the resources to bring their produce effectively to market. Also in the Caribbean, the US$7.5 million Market Access and Rural Enterprise Development Programme (MAREP)will increase the incomes of unemployed or self-employed young men and women in rural areas. From there we go to Central America, where our innovative market-access and value-chain programs have been proving successful. In Guatemala, the US$41 million Sustainable Rural Development Programme in El Quiché places an emphasis on women and young people, but its benefits will extend to the business operators, family farmers, wage labourers, craftspeople, and microentrerenuers in the region. Next door in El Salvador, the US$40 million Rural Territorial Competitiveness Programme (Amanecer Rural) will help to increase employment, incomes and food security for family farmers. The programme also seeks to expand agro-entrepreneurial associations and create more opportunities for small businessmen and women. Heading down the Central American Isthmus to Honduras, the US$37 million Sustainable Rural Development Programme for the Southern Region (Emprende Sur) will facilitate participation of small rural enterprises in value chains, expand their access to national and external markets, increase food security and reduce vulnerability to climate change. In Nicaragua, we have the US$15 million Development Programme for the Agricultural, Fishing and Forestry Productive Systems in the Indigenous Territories of RAAN and RAAS (NICARIBE). The programme will raise incomes in the region through enhanced production, sustainable natural resource management and development, and stronger community organizations. And while 2010 was a challenging year for Haiti, we are working with the government to build a long-reaching plan that includes programs that will improve access to credit, markets, tools and training. In its April 2010 meeting, the Executive Board of IFAD approved a debt-relief package that provides the basis for permanent debt forgiveness of Haiti’s debt burden to the organization. Prior to the earthquake, IFAD had three ongoing projects in Haiti, for a total amount of $50 million, and was the second-largest financier of the agricultural and rural sector. We recently allocated an additional $18 million for a project that is currently under design, plus $2.5 million for a job-creation and irrigation project. With these new projects – plus the ones we have in the pipeline for 2011 and 2012 – we can expect our regional portfolio to become younger and more dynamic. More importantly, the projects and programs we fund will provide a greater emphasis on market-access, micro-enterprise development and value-chain strengthening, which, as we see from our newsletter article on ‘proximate context’ will be key drivers for rural poverty reduction in the region. “So many of our dreams at first seem impossible, then they seem improbable, and then, when we summon the will, they soon become inevitable.” You’ll never guess who this quote comes from… Superman himself, the late-great Christopher Reeve. And while it may require Superman- or Wonder Woman-like powers to meet our goals for 2011, I nevertheless think that what may seem improbable now will soon become inevitable. At the heart of our 2011 work will be the design, implementation support and direct supervision missions carried out by our dedicated Country Program Managers and their teams. Especially noteworthy are the mid-term reviews of the Productive Initiatives Support Programme in Rural Areas (PAIP) in Haiti, the Sustainable Development Project for Rural and Indigenous Communities of the Semi-Arid North-West (PRODESNOS) in Mexico, and Paraguay’s national rural poverty-reduction program, Paraguay Rural. This year will also see the project completion of programs we’ve come to know and love, including the Sierra Sur program in Peru, the Management of Natural Resources in the Chaco and High Valley Regions Project (PROMARENA) in Bolivia, the second phase of the Food and Crops Intensification Program in Haiti, the Programme for the Economic Development of the Dry Region in Nicaragua (PRODESEC), and Uruguay Rural. These programs have provided invaluable lessons in rural poverty reduction and have helped improve the lives and livelihoods of thousands of poor rural people. My greatest wish for 2011 is that the bold first steps taken by these programs continue on for the next generation to enjoy. Read the latest edition of our regional newsletter.